I could'nt peek in here, as i had loads of work after the home got painted and my phone/broadband line was not working. it all made me stay away from the blog. I am back on track now. Next to the Tomato soup, Veg clear soup is my favorite. when i prepared it at home, it was so easy and it tasted far far better than the restaurant served one's. Heat Ghee in a Bowl, add sliced onion and saute it. Add all the vegetables(carrot, beans & cabbage) to the bowl and saute them. Add 2 cup's of water to the bowl and let the vegetables get half cooked. Mix the corn flour with 5 tsp's of water without any lump's. add the corn flour starch to the bowl and mix well. Add salt to taste, and aji-na-moto a pinch and let the soup sit in the stove in slow flame. Add Spring onions and pepper powder. when the soup get's little thicker, remove from the flame and serve. Serve with bread stick's or with spiced corn flake's. * The corn flakes in the images are just plain corn flake's. check the spiced one's here. It just took 15 mins of time in total and the production cost of this soup could be less than Rs.25, I don't know why the restaurant's charge double the amount. Day's roll on so fast. I have Lot's of work coming by, in two day's. I wanted to post and mark my presence here before that. Today My Son's school re-opened after Christmas Holiday's, and life turns organised for me now again. Here in Chennai, Street Side Soup Stall's are becoming Famous. 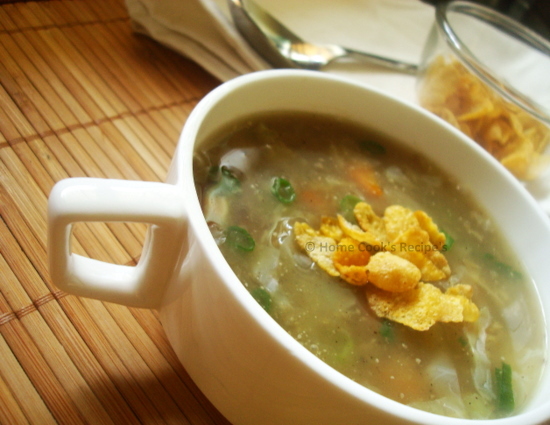 Once I tried Vegetable soup in a stall nearby and loved these spiced cornflakes topping's on it. It gave a nice crunch to the hot soup along. so when i prepared vegetable soup today, i definitely needed these spiced cornflakes. Heat the Ghee in a Pan, add peanuts and roast it, till it turns into golden colour. slow the flame. Now add curry leaves and roast it. add chilli powder and salt and mix well. Now toss the cornflakes with spices from the pan. toss it well. You can add this to soup's. 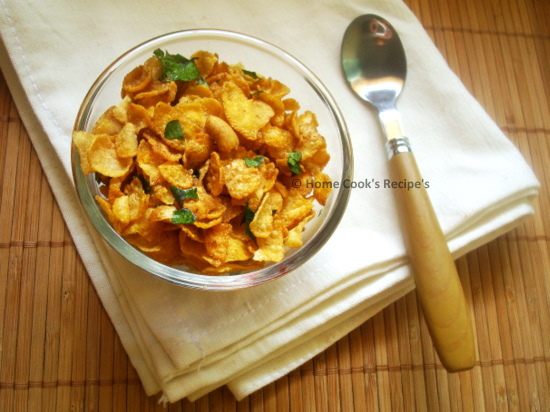 also you can have these spiced cornflakes with sambhar rice or rasam rice. This is a very quick post. 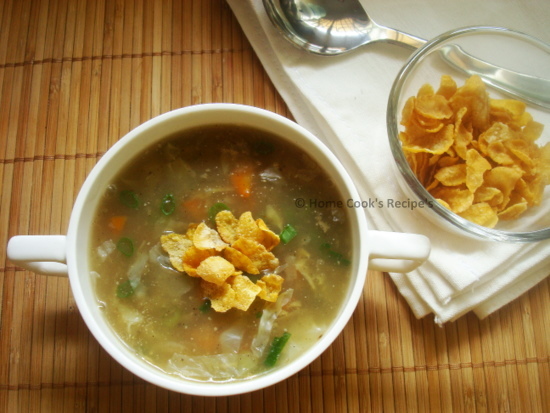 In my Next post, i will share the vegetable soup i prepared, to which i added these cornflakes. 2. Eat more Fruit's and Vegetable's and boost Immunity. 3. Walk for 20 minute's a day. 5. Try to blog more healthy recipe's.